Funky! That's the word that sums up the CarGo from Cygnett. This clever little device attaches to the headrest of your front car seats in order to allow backseat passengers the ability to watch movies on your iPad. Snazzy! Perfect for families or people going on long drives but the only downside to the product is that the driver cannot watch! The installation of the CarGo was a "snap" and thanks to the brackets supplied by Cygnett, it simply attaches itself to the headrest. It did take us a while to figure it out but once attached, it was going nowhere. 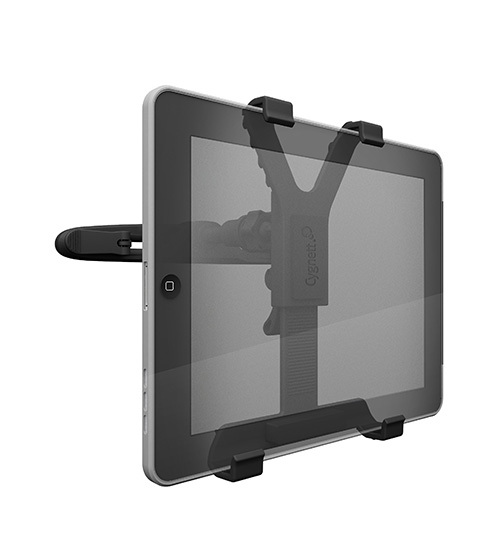 Another cool aspect of the CarGo is that certain iPad cases can still be included when connecting it to your car. For stability, it was quite secure and I highly doubt that it would fall off due to the high quality mount bracket. Another highlight of the CarGo is that the screen allows for 360 degree rotation which is useful to minimise the glare on your iPad or assist other passengers to view the iPad. It was also a little strange to watching movies in the backseat (my poor partner was the driver) but after awhile, it was like second nature. Downsides? There are none! Why buy a DVD player for your car if you already own an iPad and best of all, it holds more movies and the battery lasts longer. This is one clever device that although has limited functionality is definitely the perfect accessory for those long long trips. What a funky and snazzy device!